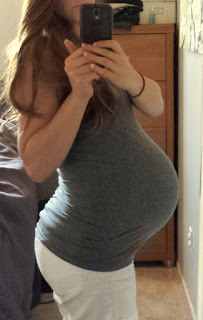 I was 41 weeks and 4 days pregnant on Saturday, and by this point, I had been having prodromal labor for weeks. I was also getting close to the "cut off" day that you can still deliver with a midwife in our state. After 42 weeks, I would have to be in the care of an OB. I truly wasn't expecting to be pregnant at this point, and with the days running down, I took my midwife's "induction cocktail" (a mixture of apricot juice, castor oil, water, and almond butter--which I had to substitute because I'm allergic to nuts) to see if it would put me into labor. I am usually against interventions and I never thought I would go the "castor oil" route, but we decided all things considered it was the best option. I was induced with my first son and I really wanted to avoid pitocin and that hospital experience again. I took the drink at 5pm, and was very skeptical that anything would happen. At 8:00 pm, contractions started, which was really nothing new for me. The only thing that was different was that they were coming closer together than normal at 3-4 minutes apart. With most of the prodromal labor, I had contractions at 20 minutes apart. Still, having had so many of these episodes, I didn't want to jump the gun. My husband, however, was immediately convinced this was the real thing and went to go blow up the birth pool. I told him not to be disappointed if it didn't go anywhere. We watched a show on tv for the next hour and I bounced on my birth ball. 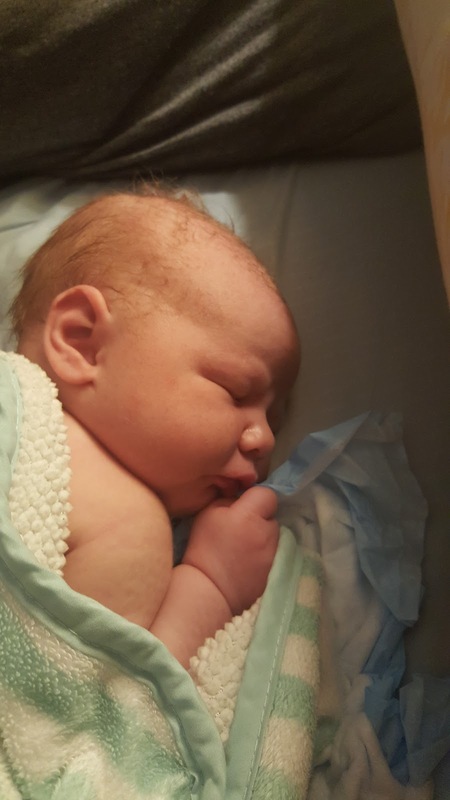 At 9, my husband asked if I wanted to give the midwife and my sister-in-law a heads up, but I still wasn't sure if I should. 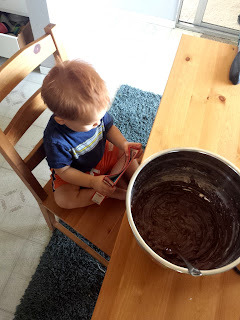 By 9:30, he finally convinced me that I should text the midwife and let her know, and he called his sister. We just told them to be "on alert." I continued having contractions at 3-4 minutes apart and my husband set a few more things up. I figured if this was labor I would have hours to get other things ready so I took my time. At 10:00pm, I had bloody show and I finally thought, "Hmm. Maybe this is the real thing." I told my husband he should tell his sister to come over, just in case. I decided to get a few more things ready and went to our bedroom. I was going to fix my hair, get my bathing suit ready (for the birth pool), get the camera out, etc. I had another contraction and was leaning up against my bedroom chair when all of sudden my water broke (this was at 10:30pm)! I was in complete shock. In the hospital with my first birth, my water didn't break on it's own. They had to break it at 7 cm. Suddenly, I was realizing this was it and I was possibly much further along in labor than I had imagined. Was I already past 7 cm? I knew that contractions usually get much stronger after your water breaks, so I started to brace myself. My husband called the midwife and she said she would be on her way (she is 45 minutes away). Since my water had broken and would continue leaking, I got in the birth pool. Thank goodness my husband had had the foresight to set it up already! He started filling it up with warm water, which felt very relaxing. I remember thinking about how the warm water can make your labor progress very quickly, and my midwife's caution to not get in the pool until she arrived. But at that point, there was no keeping me out of that water. It was the only thing that sounded good for the pain of the contractions that started coming. Still, at this point, the contractions were not as bad as what I had experienced being induced on pitocin at the hospital, so I was thinking I still had hours to go. My husband was still running around getting things ready, like the camera, and I was thinking I wouldn't really need his support for a while. My sister-in-law arrived at 11:00, right as I was in the middle of a contraction. I think she was a little shocked that things had already progressed so far. At this point, I was having to focus and couldn't speak through the contractions any more. She started timing my contractions and my husband rubbed my shoulders. I started to have a lot of trouble relaxing through the contractions, which was so frustrating because I usually have more control over myself. The midwife arrived at 11:30 and started trying to coach me through relaxing more fully. I was getting frustrated though because I just couldn't seem to do it! I was moving around a lot during the contractions and she wanted me to stay in one place and focus, but it just seemed impossible! Contractions were starting to come one on top of another and lasting over a minute now. Still, I was thinking I had hours of this ahead because this is what it felt like on pitocin when I was only 5-6 cm. I had no idea I had already been in transition. But my midwife heard a noise I made and said, "It's time to push." I told her, "This has been too easy, there is no way it is time to push!" Which looking back on is pretty hilarious to me! She and my husband had to convince me and I argued with them. In the hospital, I had felt like pushing at 6 cm and my cervix had started to swell, so I was afraid that was happening again. My midwife checked me to relieve my fears and told me that it was definitely time to push and that baby was right there! It was only midnight at this point! I did a practice push, and my midwife told me baby was coming down quickly with each push. I just couldn't believe it. I was in shock. I had pushed for 3 hours with my son. Everything was going so quickly. With my son, I had an epidural for the pushing phase so to feel the pain of it this time was a new sensation. Still, I have to say it was nowhere near the pain of pitocin! I also like the pushing contractions so much better than the ones where you can't "do" anything while they happen. The pressure of him coming was so intense and I didn't really know how to focus my energy so I became a bit frantic at one point, until my midwife helped me into a good position in the tub and told me how to push. In three more contractions, he was out! 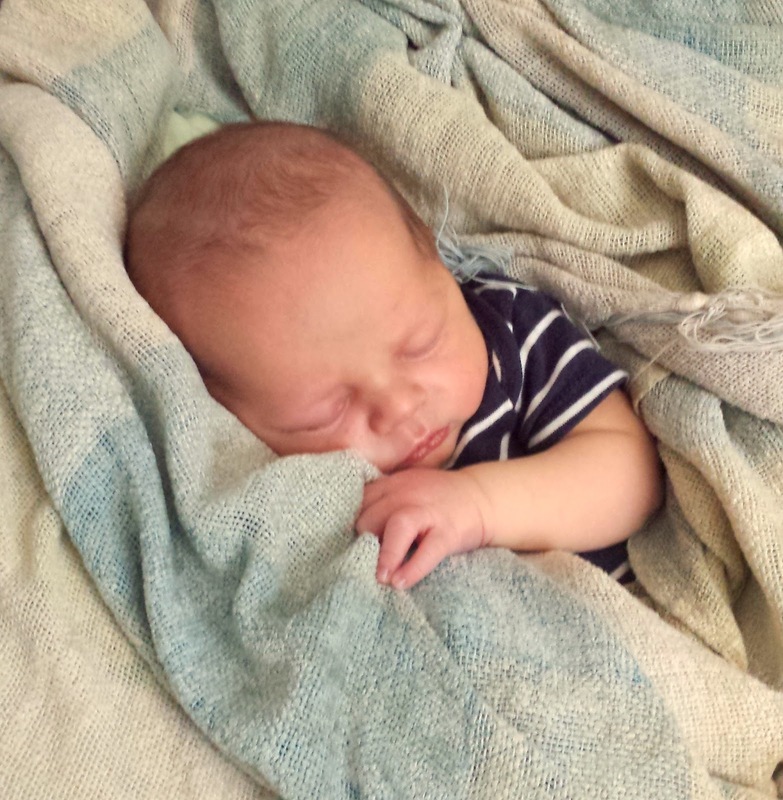 The cord was wrapped around his neck once so my midwife quickly unwrapped it and helped bring him up to my chest. He was born at 12:23 am. Not even two hours after my water had broken! I just sat there in shock. I expected to go through a marathon of pain, and here it was, already over. I couldn't believe I had just had a baby. In my dining room. We didn't know the gender, so I asked my husband, is it a boy? And sure enough it was! He looked so tiny to me compared to my first son. I was thinking he must be 6 pounds, mostly because I am just so used to the size of my toddler now! But later when they weighed him, he was 8 lbs 3 oz. Almost exactly a pound less than my first son was. I was thankful to have had a smaller baby that was easier to birth this time. I had watched my weight more closely this pregnancy (total weight gain of 40 lbs instead of the 50 with my first son). After a little skin to skin in the tub, they helped me over to the couch and I got lie there with him while everyone cleaned up. It was amazing how my whole house was put back together in less than an hour. My sister in law drained the birth tub, my husband put our dining table back in place and the midwives cleaned up who knows what else! Next, they did the newborn exam, checked me (no tears! ), and cut the baby's cord. He got to stay attached to his placenta for at least an hour, which was just incredible. The midwives made sure I was in bed and comfy with baby and then left at 2:30 am, just two hours after he was born. I was feeling so much shock and awe at everything that had happened. The difference between the hospital experience and this one was night and day. I couldn't believe how good I felt. Or that I could walk so easily and didn't feel like passing out. I felt like myself and I had just had a baby. I didn't realize just how much the drugs of the pitocin and the epidural had effected me in the hospital. There has also been a marked difference in how baby responded after birth. He latched right away and has been eating ever since, whereas with my first, he wouldn't latch at all for the first day. He had no interest in eating. My recovery in every way has been incredible. With my first, I couldn't sit on couches or chairs for two weeks. With this birth, I could already sit the very same day. I could barely walk or lift baby for three weeks with my first, and again, this time, I could already do so easily the very same day. After this experience, I feel my passion for homebirth rejuvenated in a new way. I wish everyone could experience birth this way, mainly because I wouldn't want anyone to go through what I did in the hospital. Still, I am thankful that God gave me the hospital experience so that I wouldn't take this birth for granted. He answered my prayers in every way for a beautiful, peaceful, easy, and quick labor! I know it's been a long time since I've updated, and I've left everyone hanging after the exciting announcement that we might be moving. We did move and we love our new house, but between all of that and my pregnancy, blogging took a back seat! So what am I currently up to? I haven't done any of the bi-weekly updates here like I wish I had, but it was just too much this time. I have found I have just enough energy to keep up with my toddler, keep the house clean, do the gardening and laundry, and pull some dinner together. For my sanity, I have always prioritized having a clean house (I just can't think or function in a dirty/cluttered one), so other things have gone by the wayside now that most of my time is spent chasing after and entertaining my little guy. I didn't really think I would still be pregnant at this point (aren't second babies supposed to come sooner?! ), so I don't have any plans for the week other than my midwife appointment. Not having any plans when you are waiting for baby is the worst! I desperately want the distractions so that time will go faster! We are planning another homebirth this time, but I am completely open to how it will go. I have tests and an ultrasound on Thursday to see if fluid levels are good and the placenta is still functioning. If so, I can continue on with the pregnancy, but otherwise I would go to the hospital to be induced (as I was with my first). After 42 weeks, you cannot deliever with a midwife per state law, so we'll have to make decisions if I get to that point. 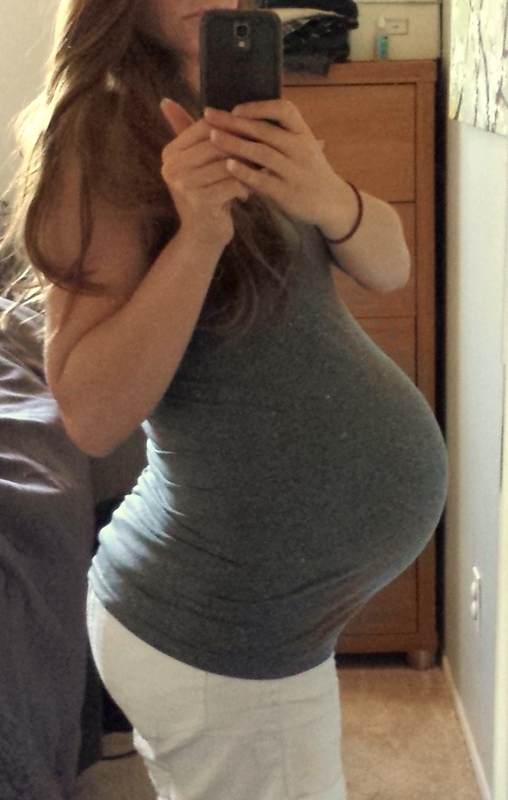 For now, I'm still hopeful that I will go into spontaneous labor within this next week! We are currently in escrow on a home and Lord willing we will be moving in a little over a month. We're staying in the same area but finally settling down into our own place. The fact of the matter is that our one bedroom, 500 square foot rented home is just too small to easily accommodate two children. The space itself isn't exactly the problem per se....it's more of the layout and the lack of a separate room for the children (unless we go live outside while they are napping! Oh... and take the cats with us). I can't imagine having two babies napping in this place, and as any parent knows, you do not want to live a life where your children don't nap! My husband and I had wanted to buy a house in cash and that plan seemed like it would be feasible in a couple years until my husband was laid off last year. God provided a much better job for him in terms of working hours and the overall environment, but it did have lower pay. We knew that paying cash anytime soon would be out of the question. We've been living debt free and we didn't want to have a mortgage, but decided that is the best option for us at this time. Renting a two bedroom place around here would be more expensive than what we will pay as a mortgage and would give us less space than this house we are buying. Not to mention, it wouldn't have the awesome outdoor space for the kids that it does! We are excited and truly hoping that everything goes well during escrow so that we can move in a little after our son's first birthday! I'm looking forward to having double the space we have now, a separate bedroom for the children to sleep in, and being able to access the bathroom at all times. It also has great outdoor space and a separate sun porch where we can contain the cats (which is a very important point to me--I am tired of kitties interrupting nap time and having a litter box in my bathroom). It also is move in ready. All we need to do is paint it our desired colors. Yes, there is a lot of updating that could be done, but it doesn't concern me at this point in my life. I know most people want granite counter tops and nice flooring, but I'm so over caring about that. I know that most places can look 75% better with paint and the way you decorate it. At times I feel disappointed that we will no longer be debt free, so this is an area where I am really having to trust God and let go. The cheapskate in me does not like paying interest. But when I think about the chaos that would come from living in this little space, I know that we are doing the right thing to maintain peace in our family. I will try to be better about updating here as we make the move and hopefully get to show you some before and after shots. Decorating is definitely one of my passions!